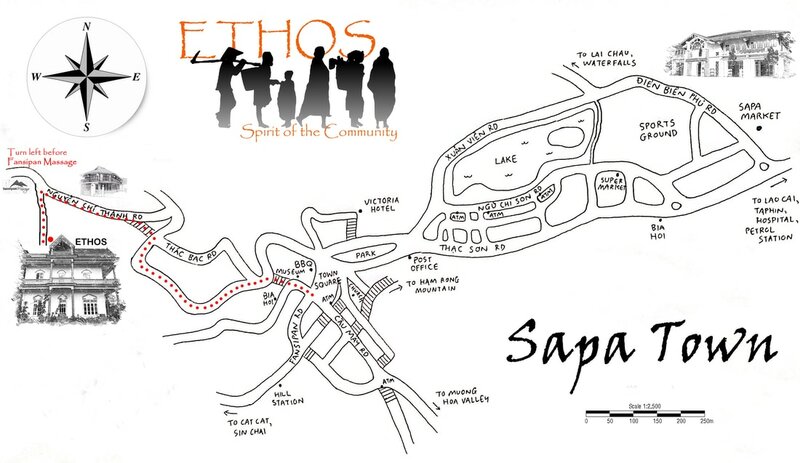 Our ETHOS Community Centre is located in a quiet suburban street approximately 1.1 km from the centre of Sapa town. From the town square, head up the staircase adjacent to Cau May Street. At the top of the stairs, you will see a restaurant on your left hand side. Continue up the hill along Thac Bac road for about 350 metres. You will pass GoSapa Hostel and the Hmong Sapa Hotel on your left. The road turns sharply to the right after Maison De Dapa on your right. Continue for a further 50 metres and you will see a set of stairs on your left. Walk up the stairs and at the top, turn left on to Nguyen Chi Thanh Street. The street surface is very bumpy. Continue up the hill for 350 metres. You will pass a wooden stilt house on the right hand side. Continue for a further 50 metres. Turn left into the small alley immediately before Fansipan massage. Continue for 70 metres. ETHOS are located at number 79 on the left hand side. Alternatively, the same journey from the centre of town takes about 4 minutes and should cost approximately 30,000 VND (1.5 USD). Please show your taxi driver a map. Our ETHOS Community Centre has safety deposit boxes and shower facilities. We also provide breakfast and free advice. If you are looking for something totally different, we would love the opportunity to meet and talk with you. Would you like assistance and a quotation for booking Train Tickets?